One of only 7 bungalows in very quiet mews. 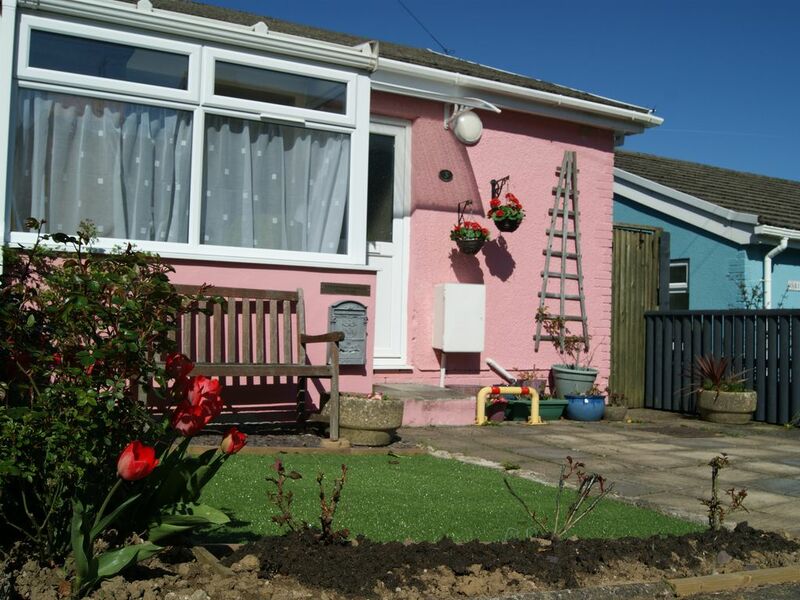 Gower bungalow, is a delightful two bedroom property offering visitors a comfortable, and enjoyable stay in a quiet mews. Situated only 100 yards from the glorious Gower coastal path, it is strolling distance to the charming village of Mumbles. Facilities include, fully fitted and equipped open plan kitchen, washing machine, wall mounted flat screen television and DVD, with a small collection of DVD films. Also digital radio. The double bedroom has a double size bed, the second bedroom has adult size bunk beds. All beds are ready made up for visitors with freshly laundered and ironed linen. Also provided are hand & tea towels. The black real leather corner unit is spacious and comfortable. This open plan area leads via internal French doors into the conservatory which is furnished with high quality table and chairs.The conservatory leads via external French doors onto the first of two outside areas, the upper is patio the lower is decking, they are both furnished. The property has full central heating for the winter months. Swansea: Swansea is Wales second city and comes up to expectation. It is a lively city with an abundance of culture with its museums, art galleries and round the year exhibitions of various kinds. It sits to the right of the sea and every nook and cranny reminds us of our maritime traditions. Visit the award winning marina and its exciting architectural surrounds. Swansea can boast an excellent shopping centre and abundance of good restaurants bars and cafes. The city indoor market is a must for the resident and tourist trade. Transport is very good and has a central national bus station as well as train station. One other thing apart from its seaside attractions, Swansea is famous for it many wonderful parks, including Clyne Park and Singleton Park. Mumbles village: Mumbles is a lively and charming welsh seaside village. It boasts an abundance of restaurants and bars as well as cafe's and ice cream parlours. West Wales: Places such as Tenby, Saudersfoot and Pembroke are all within relatively easy driving distance for those who cannot bear to be so near and not experience the magnificence of the west Wales coast and countryside. I am now retired having worked mainly in the public sector. I live for many years in London but came back to Wales over 25 years ago and have felt to be on holiday ever since. It is very important to me that guests enjoy what I try to make an affordable and comfortable stay in my 3 different holiday properties. Dogs I welcome provided they are never left alone and are fully house trained. Gower Bungalow is situated literally a two minute walk from the start of the Gower Coastal path. It is one of 7 bungalows in a quiet mews so no through traffic. Parking is immediately outside of property and it has a front garden as well as secure enclosed rear where you can sit out and relax either on the upper patio or the lower decking area. Easy access to coastal path and village of Mumbles. Walking distance to ice cream, beer and Italian restaurant. Electric heaters provided and timed central heating from first week of October until end of April. Beds are ready made up with freshly laundered and ironed bedding. Parking immediately outside of bungalow or across the way on parking bay. Free internet. Code is clearly visible in bungalow. We do not provide large towels only tea towels,hand towels and shower mat. We very much enjoyed staying here at the bungalow - a lovely place, stylish and thoughtfully furnished, with everything we needed. We appreciated finding a dish of chocolates when we arrived, with wine and crisps, and also tea, coffee, and sugar in the kitchen - lovely and welcoming. It was great to visit our family and enjoy the coastal walks - we hope to come again soon. Thank you Paula for a great place to stay. What had been a nice weekend despite the "mini beast from the east" was ruined by the owner arriving and knocking on the door at 9.50am to see if we had vacated - I had noticed her car parked outside before 9.30am. Whilst I appreciate the vacate time was 10,00am, we were actually tidying up the property as we believe in leaving places as we find them. The owner came into the property. so was aware we were clearing up, and then left to wait in her car. At 10.01am A CAR HORN WAS HONKED presumably to chivvy us along, so we rushed and dumped everything in our car leaving the property at 10.08am. The owner has sent an email to apologise stating she was under time constraints, however not impressed with a reminder at 1 minute past the hour and a car horn being honked when we were saving her some time. Perhaps a little more patience and thought required. Won't be booking here again! I am of course very disappointed in this review. We go to enormous trouble to make our property a pleasant and enjoyable experience. It is true that I did speak to the visitors before their departure and felt our exchange was friendly and polite. When I returned to my car to give them some space to finish clearing up and packing I ACCIDENTALLY leant on the steering wheel making a very short single beep. This was explained to the visitors however it would seem that my explanation of this mishap on my part was not believed. The response to this genuinely unintended mishap is I feel very harsh indeed. I do note however that although when speaking with the visitors (immediately prior to the accidental beep) they complimented on how lovely the bungalow was. The 1 star review is entirely based on a misunderstanding on the part of the visitor not on the quality of accommodation. We booked this lovely bungalow at very short notice. It was only our second visit to Wales but what a lovely place the Gower Coast is. The bungalow was a clean and very comfortable place to stay after a day of walking. We loved the fact that he coastal path is a very short walk from the bungalow. In spite of unsettled weather, we were cosy and warm. We shall definitely be returning. Thank you Paula for the very enjoyable bottle of wine! Thank you for such a nice review and I’m pleased that you had such a nice stay. I would be very pleased to have you visit again. my wife and I had a very peaceful 3 night stay in April. Lovely dog-friendly area, with lovely cliff path and beach walks, and local restaurants and pubs were often very welcoming to us and our labrador. The cottage was quiet and comfortable, and we were fortunate to have early morning sunshine for breakfast in the conservatory, even though the wind outside was very chilling. We didn't cook for ourselves, but it looked as though the kitchen was very well equipped had we needed to. Could not be better, Would love to stay there again and again, people very nice, Could not be more helpfull. bungalow in quiet mews but walking distance to various restaurants and Bars. Mumbles village is a five minute drive or a 20 minute walk along the coast/pier path. Access to the beginning of the Gower Coastal path is literally 5 minutes walk from the front door of the bungalow. Gower bungalow is open all year round. Exception to low season prices is the Christmas and New Year weeks which are charged at £400 per week. During the months from October to the end of March full central heating is provided at no extra cost. This is on a timer from 8am till 11am then 4pm to 11pm. There is constant hot water at no additional cost but electricity is provided via £1 meter. Dogs are welcome there is a small charge of £10 per dog per week maximum two small/medium sized dogs. Please note dogs must not be left in the bungalow alone or allowed on furniture or beds, and we do ask that owners please make every effort to ensure that all dog hair is removed from property before departure.